“Have you already been to Tai’er zhuang?” – asks us the owner of the small restaurant where we had dinner in Yaowan. “No? – You should go there, it is much better than here!” “That’s true,” – joins in one of the guests at the neighbouring table, a young local entrepreneur – “They started to develop earlier than us. But in 1-2 years we will catch up with them.” Tai’er zhuang is another ancient water town on the Grand Canal, on the border between Jiangsu and Shandong, and lies on our route. And so it is decided – to Tai’er zhuang we go. At the exit of town there waits for us in the morning the leitmotif of our journey: a construction site with a pile of earth. After the experience with blocked roads on the way here we know better than turning around. We go on resolved through the mud and holes. When the workers see our determination, they leave down their shovels and come to help push the tandem through the earthen barrier. With joint efforts we are finally up, on the road along the Grand Canal. As we take our breath and view the bustle and hustle on the Canal, a motor-biker attempts a similar manoeuvre from the other side. He tries this way and that, but at the end his resolve weakens, he jumps back on the seat and whizzes away down the road. On our left the Canal buzzes with activity, barges float back and forth, ships line to pass through a ship lock. In less than 20 km, however, at the county city, of Pizhou the Canal road seizes. We make a short break for noodle soup in an old alley. Across there is a shiny hairdresser with the best coiffured employees imaginable, being somewhat out of place among the shops selling paper offerings for the dead and the fruit vendors. Soon we are on the side roads again, among small villages and green fields of young crops. “Maize,” – says Volker. “Leach,” – I insist. We stop at the first house in a village to resolve our dispute. 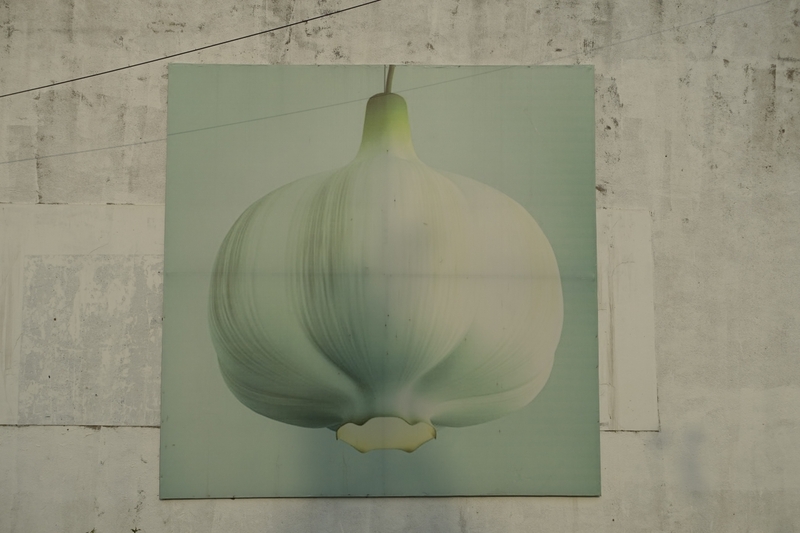 Neither, nor – this is garlic! The old man insists that we come to his home to have a rest and drink some kaishui (boiled water). With still 50 km to go we have to decline the cordial invitation. And soon we are among endless green expanse of young garlic, spreading all around. All one can see is garlic, garlic, garlic. Garlic greats us from the shop signs, and garlic murals decorate the village houses, in a style reminiscent of the flowers of Georgia O’Keefe. In another village we make an ice cream stop. Several elderly locals gather around us. “Are you Uyghurs from Xinjiang?”- they ask. “What do you trade in?” One of them is a bicycle aficionado himself. He goes around the tandem, examines carefully all parts and details, clicking with his tongue. “Aren’t you tired, biking for so long?” asks he at the end. “No!” “Yes!” – we cry out simultaneously. “If you are tired, let’s change! I ride till Beijing instead of you. I’ve never been there and in my age there might be no other opportunity. And you stay here in the village and tend the garlic instead.” I weight the two options – sore legs, or sore arms and hurting back? I opt for the sore legs. Few kilometres further we stop again, attracted by loud music and kids’ laughter. In a big Kindergarten beside the road the children have their hour of musical education. Nora watches mesmerized the dancing kids and refuses to leave even after the fourth song, while Sarah already makes plans to introduce Chinese-type of early musical education in her Kindergarten. “May we also make such parties in the Kita when we go back? It’s cool!“ So, dear Jagow-Spatzen-parents, in case you read this, what do you think about her idea? Kids are jumping and the garlic is high. so, paddle my sweethearts, why don’t you try. The garlic idyll comes to an abrupt end as we hit again the main road shortly before the border with Shandong. Lorry after lorry, bus after bus whizz beside us, amidst dust and honking. No highway parallels this stretch and all the heavy traffic goes along here. Apparently, the two provinces didn’t reach an agreement who builds this part of the road. 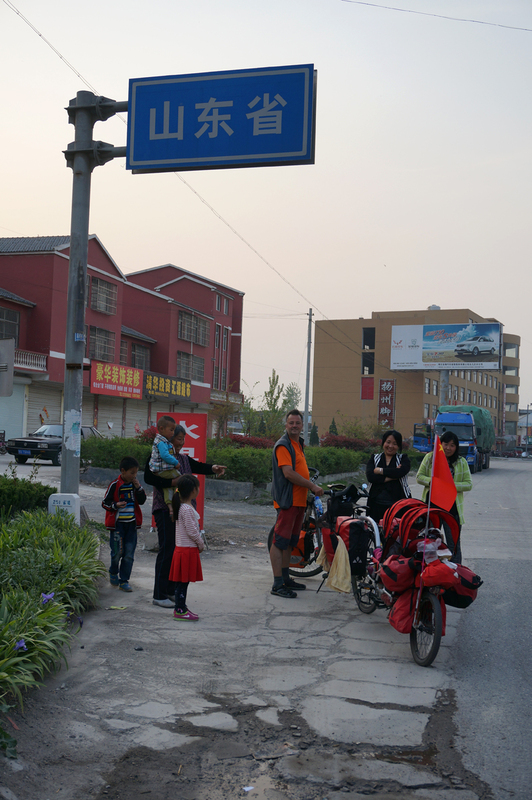 As we approach the Ancient town of Tai’er zhuang, another, this time finished visitors’ centre and an even bigger parking lot, half full with busses greet us. Yes, indeed, it is more developed here than in Yaowan! And on the culinary front, it is definitely a delight. Just opposite of the hotel is a old-style speciality restaurant. The chef won some prices and apparently put Chinese food on a new level of excellence, if you trust the newspaper clippings that hang over the display of dishes. Nice food, but his signature dish, breaded white fish, failed to impress us. Anyhow, the kids finally found the courage to engage a local girl as a playmate. This was bartered over the invention of a new signature dish: The bare cucumber, peeled banana-style. Our kid’s example spread among all kids in the restaurant. It’s the simplicity that impresses!